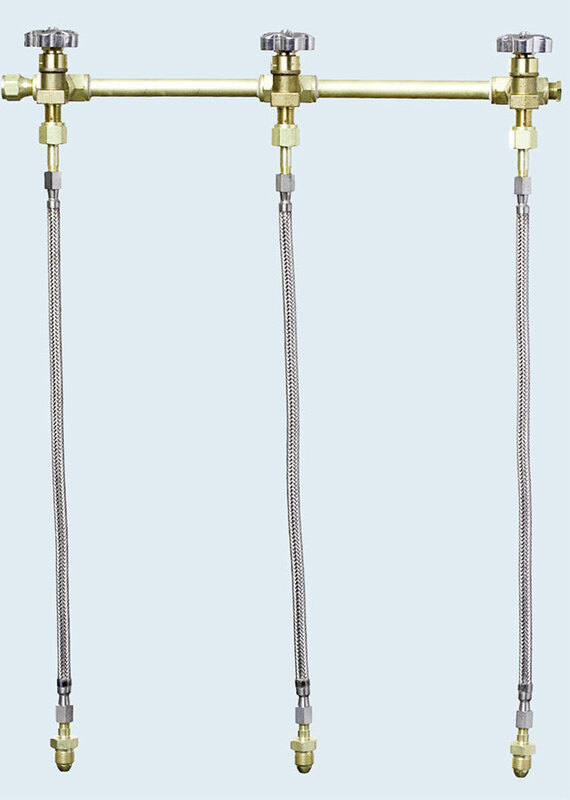 Diaphragm packless station valves for high purity. Cleaned for high purity service. Standard CGA 346 header pigtail connections when valves are installed, non-valve headers are provided with mating connections on the pigtails. These manifolds are constructed of 1/2" brass pipe silver-brazed at each joint. Station valves are the diaphragm packless type for high purity service and are installed with Teflon tape so that they may be easily replaced in the field if necessary. All header pigtail connections are CGA 346 to help ensure that pigtails are installed properly. A plug is inserted in the last tee to allow for the addition of future cylinder stations if required. Suitable brackets for mounting the manifold to a wall are provided. and check valves in the pigtails. * Complete the model number by inserting the number of cylinders to be connected to the manifold in place of the X and specifying the CGA connection.